Fired by the success of the Bynack More climb the day before, I've resolved to attempt Braeriach - Scotland's third highest mountain - today. 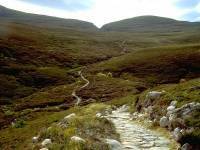 If I feel up to it I shall continue round to Sgor an Lochain Uaine and ultimately Cairn Toul, with an option to return the same way or drop down into Glen Einich. 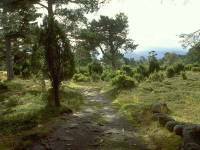 After catching the bus from Aviemore to Inverdruie, I've taken this path through the Rothiemurchus forest. 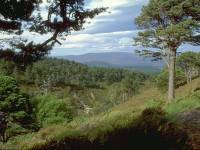 Rothiemurchus is one of the largest remaining areas of natural forest in Scotland and is quite beautiful. 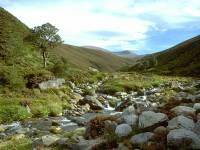 This is a minor path along the right bank of the Allt Druidhe. 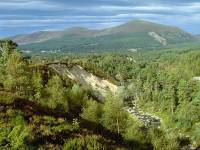 Two miles out from Inverdruie is the Cairngorm Club footbridge, dating from 1912 and erected just downstream of the watresmeet between the Druie and the Beanaidh (the outflow from Loch Einich). 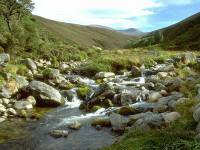 The view upstream along the Allt Druidhe from the bridge. About three quarters of a mile beyond the bridge is a path crossing. 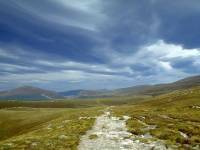 The unremarkable path to the right heads for the Lairig Ghru; the path ahead is bound for Loch Morlich. 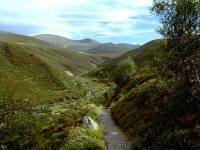 After a further mile this path approaches the left bank of the Allt Druidhe once more and reaches a break in the tree cover, revealing the flanks of Lurcher's Crag and Beinn Macdui beyond. Four miles into the walk now, and I've stopped for a morning refreshment break under this stand of pines with a view back across Rothiemurchus. 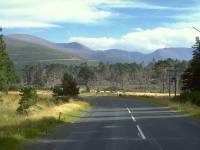 Rothiemurchus starts to fall away and I begin to reach rougher country. 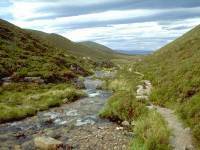 The Allt Druidhe leads up into the maw of the Lairg Ghru a couple of miles ahead. I remember how scary I found this place when I first walked this path in 1977. 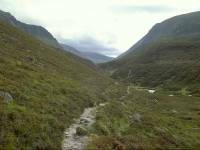 Walking into the mouth of the Lairig Ghru now, and I can see my prospective route onto Braeriach leading up the slope to the right. But the sky is greying over now and the wind has already whipped up to gale force. Is this ascent wise, I ask myself? 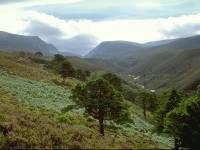 The Lairg Ghru proper. 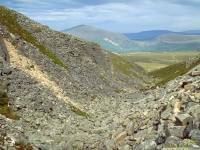 No wonder it has a reputation as Britain's toughest footpath. I'm six miles from Inverdruie, and it's another two miles to the summit of the path at 2733ft, roughly a thousand feet higher than the point I've already reached. 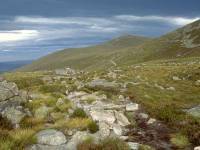 A mountain refuge hut, the Sinclair Hut, used to stand near this point but has been demolished. 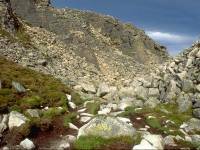 It attracted vandals and also - more worryingly - rather too many individuals were were not equipped or experienced enough to tackle this terrain. 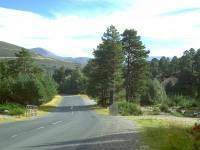 The view back along the Lairig Ghru to Rothiemurchus. This end of the pass has a reputation for fierce winds but, even allowing for that, I've had to think seriously about the prospects for the day. There have already been plenty of signs that today is going to be windier than yesterday. The sky is full of angry-looking striated clouds of blue-grey. If it's blowing a gale at 1500ft what's it going to be like at 4000ft? 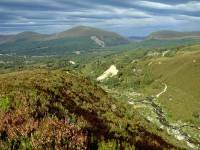 I bow to discretion and abort the plan to climb Braeriach. It'll still be there next year. To save something from the day, however, I decide to follow the path that's just merged from the left - the path from the Sugar Bowl below Coire Cas through the Chalamain Gap. It's a route I've never walked before. This is its commencement northwards. 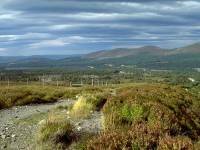 The path quickly climbs across the flank of Lurcher's Crag to give this splendid view back to Aviemore, seven miles away. And, after crossing a bleak, wet and stony moorland, it approaches the Chalamain Gap (more poperly the Eag Choire a Chomhlaich). 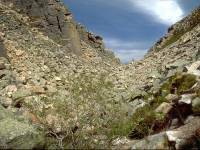 The Gap is a ravine carved by glacial meltwater. 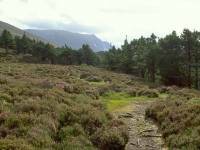 Lurcher's Crag rises to the right, Creag a Chalamain to the left. What have I taken on? 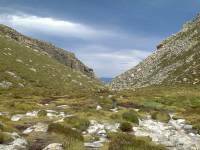 The place is choked with enormous, angular boulders. Progress is slow. Progress becomes even trickier as I approach the highest part of the Gap. The worst is yet to come. I'm over the col but the walk has become a scramble. 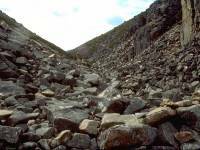 There is no even ground here and the gaps between the boulders would swallow and snap a leg with ease. Every step must be taken with the utmost care and the following move must be contemplated with all the rigour of a game of chess. This is awful, quite frankly. 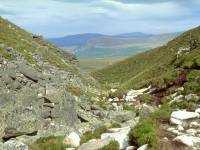 If paths were rated the same as climbs, the Chalamain Gap would be a v.diff. It's taken me over half an hour to cover a hundred yards and there's no end in sight. This is the most diffucult terrain I've ever encountered. Believe me, the photographs don't even begin to show how rough it was. The end is in sight, but it's taken me fifty minutes to pass through the gap - a distance of two hundred yards. 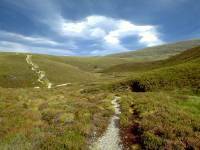 The guidebooks recommend this path as the prime approach route to Braeriach. I'm telling you, squire, you definately do not want to do that. Back on a decent path at last. 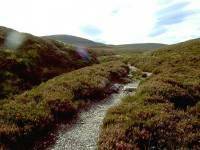 This path is heading for the Sugar Bowl across nearly two miles of heather-covered moraine. The wind has increased and is every bit as fierce as it was on the summit of Bynack More yesterday. Look at those cloud formations! I'm not walking along this path - Im stumbling along it. To stand still is to get blown over. I'm pretty much broadside-on to the storm. Curiously, given the amount of cloud cover overhead, the sun is still shining strongly through one of the few gaps. The view back towards the Chalamain Gap. 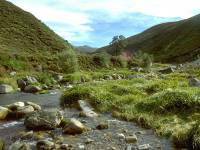 The path dips to and crosses the outfall stream from the tiny Lochan Dubh a Chadha, a name far more picturesque than the lochan itself. 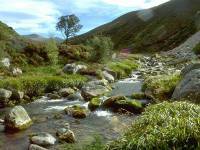 After a few hundred yards this stream merges with the Allt Geag an Leth-choin draining from Coire an Lochain to form the Allt Mor. The path follows the north bank. I'm already a mile from the Chalamain Gap, seen above. 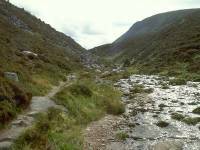 The Allt Mor is joined by the outflow streams from Coire an t-Sneachda and Coire Cas, and now forms an impressive ravine (the Sugar Bowl, just ahead). 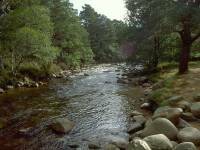 The Allt Mor has to cope with the meltwater runoff from about 15 square kilometers of snow cover every spring, including three of Cairngorm's four northern corries. 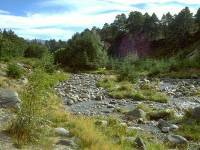 The force of the resulting torrent can be seen by the pink moraine gravel exposed by landslips each spring. 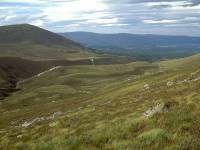 Meall a Buachaille is seen ahead, with the Ryvoan Pass to the right. Closer in to the Sugar Bowl now, with another landslp feature in view. Looking across Loch Morlich from the Sugar Bowl trail. The fence to the left encloses the pastures grazed by the Glenmore raindeer herd. The wind is still blowing severe gale force 9 and I've leaned against a tree for this shot of the Allt Mor backed by Cairn Gorm and Fiacaill Coire Cas. The path is doglegging down to a footbridge across the river. Welcome to the Sugar Bowl! At last I had some shelter from the wind and was able to stand upright. I wandered about here for some 15 minutes, enjoying the scenery to the full. The ravine scenery in the Sugar Bowl. 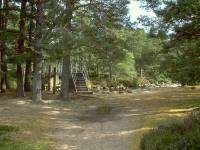 The day's expedition is nearly over as I climb to the road above and start back down to Loch Morlich. 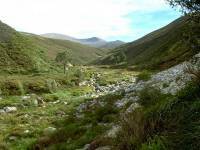 This view of the Allt Mor is taken from the road bridge a few hundred yards downstream from the Sugar Bowl. The Glemore road. The backdrop of mountain and forest in the afternoon sun is dramatic. Scotland in a nutshell. Cairn Gorm, Fiacaill Coire Cas, Stob Coire an t-Sneachda and Cairn Lochan crown the ring of Cairngorm's northern corries.